The International Union of Pure and Applied Chemistry (IUPAC) Inorganic Chemistry Division has reviewed these proposals and recommends them for approval. A five-month public review is now set, expiring 8 November 2016, prior to the formal approval by the IUPAC Council. Nihonium refers to Nihon, one of the two ways to say “Japan” in Japanese, the country in which it was found. Moscovium and Tennessine also honour the geographical place where they were discovered, Moscow, Russia; and Tennessee, USA. As for Oganesson, the proposal is in line with the tradition of honoring a scientist and recognizes Professor Yuri Oganessian (born 1933) for his pioneering contributions to transactinoid elements research. But how are elements named? Keeping with tradition, newly discovered elements can be named after a mythological concept or character (including an astronomical object); a mineral or similar substance; a place, or geographical region; a property of the element; or a scientist. 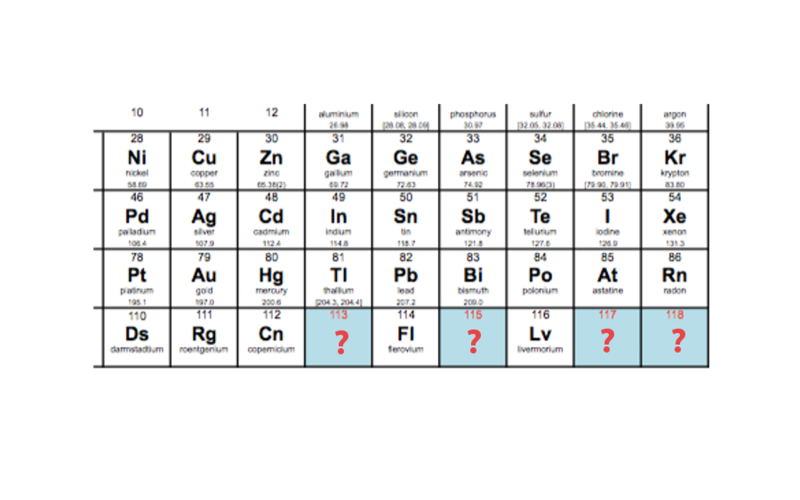 The names of all new elements in general should have an ending that reflects and maintains historical and chemical consistency, meaning “-ium” for elements belonging to groups 1-16, “-ine” for elements of group 17 and “-on” for elements of group 18. To know more about the public review please consult http://iupac.org/elements.html.